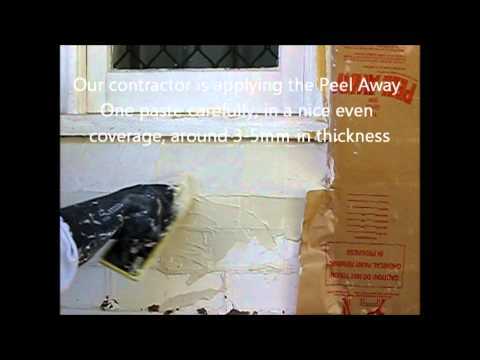 Peel Away paint removal system is an ideal material for restoration and renovation applications. Using the Peel Away system to remove lead and Asbestos paint offers a range of environmental benefits which makes it suitable for a wide variety of internal and external use. Most other mechanical methods used for the removal of old paint like sand and grit blasting, as well as high pressure blasters, have difficulties with waste containment. If the requirement is the removal of many layers of old lead paint, the end result could lead to harmful airborne particles, soil contamination and finally, water pollution. Peel Away removes these health and safety issues. What makes the product unique? How does it compare to competitors products and how long has it been on the market? What makes it unique is that the product is a thick chemical paste that is applied to the surface and covered with a special laminated paper cover sheet supplied. This allows the product to be sealed in and emulsify the many layers of paint over a time period. The laminated paper cover is carefully removed with the paste and the many layers of paint. All of this is fully contained within the laminated paper sheet and can be carefully disposed of. Since it's inception and invention over 25 years ago, very few products can compare with this proven system. Is Peel Away 8 environmentally friendly and safe to use? Firstly, there are no harsh solvents used in the product. The chemicals used are safe to handle and apply, although as with any chemical product it is always advisable to wear protective clothing. When dealing with higher contents of lead in older paints, the Peel Away product traps all the loose particles in the paste and fully contains the softened layers of paint as well. This ensures safe containment of the waste and complies with the environmental authority's law in registering lead waste. This also contributes to the reduction of lead particles going down our waterways during the washing process as all the paint is fully contained as lead waste. Any waste water can be treated when collected. Is Peel Away 1 environmentally friendly and safe to use? This product is corrosive. It is required to wear protective clothing when handling at all times. Peel Away 1 requires Neutralising if you are repainting the surface. However Steel does not require neutralising. What are the different applications of the Peel Away products? The product can be used in a number of industries and on many substrates and surfaces. It is suitable for commercial, domestic, industrial, automotive and marine. Applications include bricks, concrete, sandstone and render, softwoods and hardwoods, weatherboards, fine furniture, marble, steel, cast iron and aluminium, fibreglass, fibro cement and plaster. What impact does the product have on the construction site? Application can be done in conjunction with many other trades around. As there are no harsh solvents, the laminated cover fully seals the process and protects the process, even in harsh weather conditions. For high content and peeling lead paints it is advisable to have this work done first and the site made safe for other trades. Many larger commercial and heritage listed projects are completed using experienced contractors and other trades people. For projects of this kind, please call Peel Away for a list of recommended contractors. However Peel Away can be applied as a DIY project by following information data sheets that are supplied with the product. Instructions are comprehensive and easy to follow. When initially assessing a particular project, we always recommend performing a Trial patch with the Peel Away product. They are available at a low cost and will determine many of the factors involved with the Peel Away such as how thick to apply the product, how long to leave the product on for, how effective the product is and which Peel Away works the best. How do I decide which Peel Away to use for my project? Peel Away 1 is capable of removing up to 30 layers of oil based paint and multiple layers of lead based and other enamel / oil based paints. Any paint applied before the 1970's will almost certainly contain lead. Peel Away 1 is caustic - a strong alkaline and is corrosive to the skin, so basic precautions such as wearing of protective clothing & gloves need to be taken. After using Peel Away 1 and if repainting or rendering, Peel Away Neutraliser needs to be applied to return the surface to a neutral pH level. Peel Away 8 is a newer more user friendly product suitable for removing up to 12 layers of most types of paint. Surfaces do not need to be neutralised after using Peel Away 8. 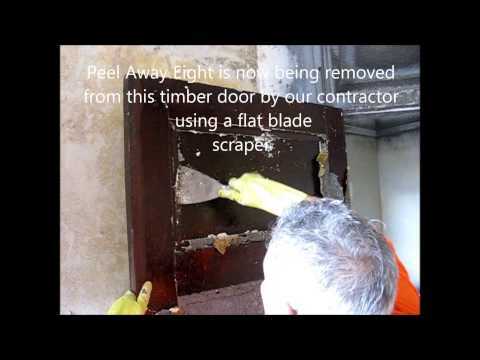 Peel Away 8 is not corrosive to the skin, although the use of gloves and other protective clothing is still recommended. Peel Away 8 is the best choice for removing the anti-fouling from fibreglass and other boats, also for removing newer acrylic and water based coatings. Peel Away is available from specialist paint stores nationally. For information, technical evaluation, applicator recommendation and guidance, please call Peel Away on 02 9746 6733. You can also buy Peel Away direct from their website.